Here's watch to look for on this weekend's Road to the Olympic Games shows featuring figure skating's first Grand Prix event — the Skate America competition from Chicago on Saturday (4 p.m. ET). In a northern nation that at times finds itself fueled by ice and snow, the sweet season is about to begin. With the next Olympic Winter Games in Pyeongchang, South Korea less than a year-and-a-half away, the pursuit of the podium is already raging for legions of Canadian high-performance athletes who make their living on frozen surfaces. In many ways it's the natural state of being in this country. When it starts to get cold our smouldering affection for sport really catches fire. The Blue Jays and thrilling post-season baseball notwithstanding, curling is the national pastime, skating is the national passion, and hockey is the national obsession in these parts. In Canada, rinks and mountains become the default fields of play when winter rolls around. At the recent Olympics in Rio de Janeiro, Canadians turned in stellar performances to finish with 22 medals, four of them gold. The swimmers and sprinters led the way to a top-10 finish on the medal table. 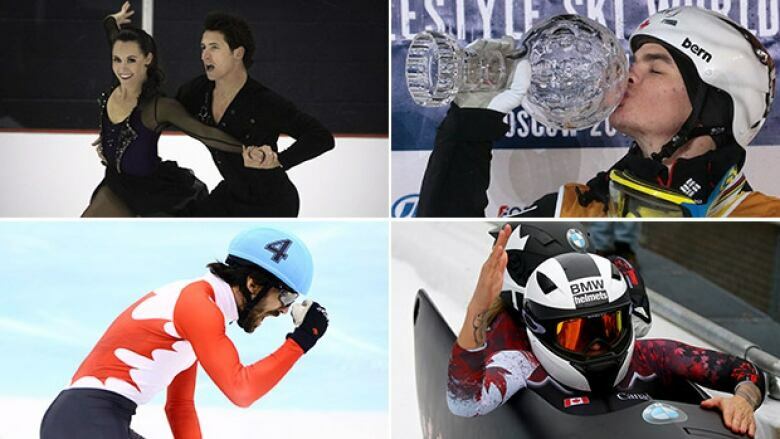 By any estimate it turned out to be the best Olympics in quite some time for Maple Leaf men and women. But when it comes to the Olympic Winter Games, expectations are that much higher. Over the past two quadrennials Canada has been a top-three nation, and with the next gathering in Korea just around the corner, the hope is there are enough Canadian stars still front and centre to drive the narrative. In particular, as the Road to the Olympic Games begins the journey to Pyeongchang in earnest, there are compelling characters who will deliver plot points on the way to Korea in February of 2018. In figure skating ice dancers Tessa Virtue and Scott Moir have returned to competition with the express goal of winning another Olympic championship and perhaps securing a legacy as the greatest at their discipline of all time. Figure skating kicks off with the Skate America competition from Chicago. Canadian pair skaters Julianne Seguin and Charlie Bilodeau are an up-and-coming team worth watching this weekend. Speed skater Denny Morrison is trying to reclaim his winning ways in the wake of a motorcycle accident and a debilitating stroke. Morrison will be joined on the oval by world champion Ivanie Blondin, who is eyeing the Olympic debut of the mass start event at the Games in Korea. On the short track, veterans Charles Hamelin and Marianne St-Gelais continue to lead the way, with Hamelin looking for a fourth Olympic appearance. He's also hoping to surpass Marc Gagnon as the most decorated short track speed skater in Canadian history. The World Cup alpine ski season promises plenty of intrigue from an international standpoint. Superstar Lindsey Vonn of the United States is back on snow to chase the all-time wins total currently held by Ingemar Stenmark of Sweden. Aksel Lund Svindal, the Norwegian giant plans a return to the fray after tearing up his knee while racing the famed Hahnenkamm at Kitzbuhel last season. There's even a rumour that the notorious 39-year-old Bode Miller will attempt a comeback if he can end his contract dispute with Head skis. From a Canadian standpoint, hope on the slopes will rest on the women's side with Marie Michele Gagnon in the wake of Larisa Yurkiw's retirement. The men's team will get a boost as 2015 world championship silver medallist Dustin Cook reappears after a season missed with injury. And Erik Guay, now 35, continues to chase the only thing he lacks in his career — an Olympic medal. Bobsleigh competition features the tenacious two-time Olympic champion Kaillie Humphries, who has charted a history-making course as she continues to push for gender equity in the sport. And in freestyle skiing, Mikael Kingsbury, the most prolific racer of all time, is only now approaching the prime of his career. The most competitive sport in terms of making the Canadian Olympic team is curling. This season is critical as men's and women's rinks vie for spots at the national trials in December of 2017. Although Canada has never failed to make the podium in curling since the sport re-appeared at the Olympics in 1998, no one has repeated as the gold medal champion. Brad Jacobs, Brad Gushue and Jennifer Jones are still all in the hunt to do so. All of these athletes have been training for months now. In fact, for most, the training never stops. Now as October deepens and old-man winter prepares to arrive, their road to the Olympic Games continues full speed ahead.